During a dance rehearsal in preparation for Sunday's MTV Video Music Awards, a 6-foot-long snake bit the left arm of one of Nicki Minaj's backup dancers. The bite wasn't life-threatening - the snake, Rocky, is a boa constrictor and isn't venomous - and the dancer was sent to a hospital out of an "an abundance of caution," a Viacom Media Networks director told MTV News. Rocky, likewise, escaped the incident unscathed. It's not the first time a boa constrictor or python has made VMA headlines. In 2011, Justin Bieber brought his pet albino constrictor (which he would auction off two years later) wrapped around his wrist. And a decade before that, Britney Spears took to the stage draped with a Burmese python quite a bit larger than Bieber's snake. But Rocky is the first to underscore a critical point - that snakes are more than props or accessories, but animals capable of causing injury or, if improperly handled, being injured themselves. "Being on stage can be a stressful experience for people, can you imagine what it's like for an animal that has no idea what's going on, with the noise, lights and rapid movements?" David Steen, a herpetologist at Auburn University, writes in an email to The Dodo. 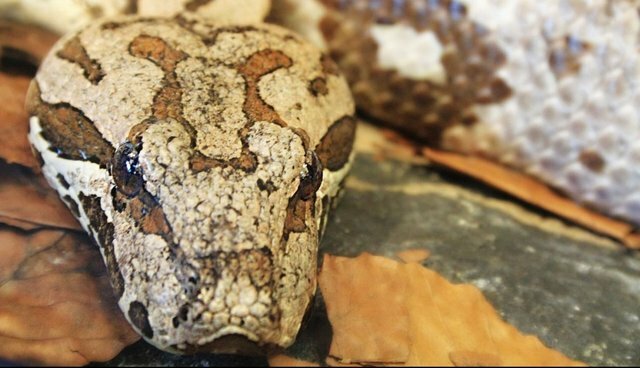 "You can expect any animal to attempt to defend itself when it feels threatened, and that was undoubtedly the case with this particular boa constrictor." Boa constrictors have a reputation as docile reptiles, which makes them popular pets. But snakes, unlike cats and dogs, don't have the benefit of thousands of years of domestication. "Any large animal is a potential danger to people," Steen says. "This can be the case even for animals that are used to the treatment, as we learned with the Siegfried and Roy tiger tragedy." Rocky, for example, is a 15-year veteran of the entertainment industry, according to MTV News, without a previous history of biting. In the end, Minaj performed "Anaconda" snakeless. The rapper, TMZ reports, missed her snake - but a nocturnal boa like Rocky is likely more at peace outside the limelight. Correction: A previous version of this article stated the snake in Spears' performance was a boa constrictor. It was an albino Burmese python.